In an unorchestrated and somewhat old school manner, the team at Cuccio discovered one of their biggest fans in the professional world of hairstyling was none other than Robert Cromeans. After getting a sample and learning that the Butter Blends are great for hairstylists' hands, the world-famous artistic and business director at John Paul Mitchell Systems was so taken with the product he agreed to help get the word out. Cuccio decided to launch its first-ever national ad campaign on the second season of TLC's Global Beauty Masters (Thursdays at 6 p.m.). They asked Cromeans to make the endorsement and he didn't hesitate. "We did not have a large budget for this but Cromeans treated me as if I was his top priority," says Robert Novak, creative director at Cuccio International. "He is everything I was told he would be." Mina Lu, Executive Director of Global Beauty Masters, also moved mountains to get the campaign scheduled. "Within an hour, she pulled this all together," Novak states. A sneak preview of the ad aired during America's Beauty Show Main Stage events on March 12. 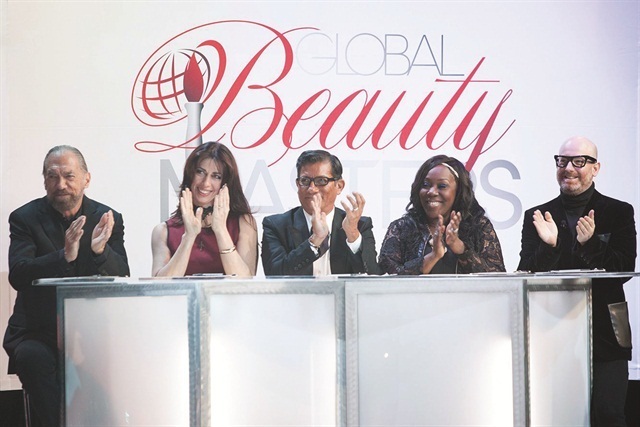 Then on March 17, it started appearing regularly on this season's Global Beauty Masters. "This whole partnership was a testament to doing things a bit old fashioned and then supporting it with the new technologies associated with social media," Novak says. "I believe this cross promotional effort is the next wave in our industry." Don't miss this season's Global Beauty Masters, hosted by Nicole Murphy. Jaime Schrabeck is Competition Director and John Hauk is one of the judges. Click here to see the Cuccio commercial.